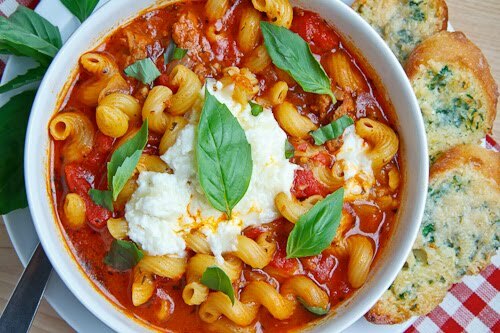 Lasagna is made with a tomato based meat sauce layered with pasta and cheese and this soup has it all from the tasty Italian sausage and tomatoes to the pasta and it is topped off with a dollop of cheesy goodness that will warm your heart on a cold winters day. Winter is the time for soups and I have been certainly making a lot of them lately! Lasagna has to be one of my all time favourite meals and when I recently came across the idea for a lasagna soup on a farmgil’s dabbles I was immediately enamored with it. 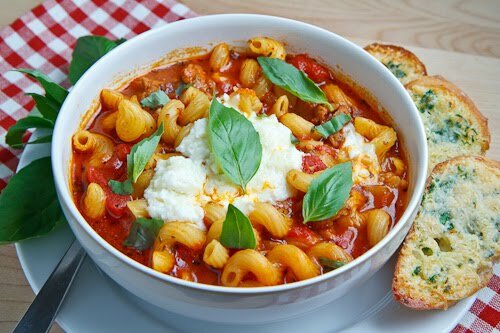 A basic lasagna is made with layers of a tomato meat sauce, pasta and cheese and this soup has them all! At the base of the soup is some tasty Italian sausage along with diced tomatoes to form the ‘sauce’ of the soup and of course it is easy to add pasta to any soup and that only leaves the cheese layer which is added just before serving in the form of a dollop of cheese that melts quite nicely into the hot soup. This soup is pretty easy to make and when it is cold out I certainly don’t mind the long simmering times that soups often require to bring out their flavours. Really the only thing that you need to remember when making this soup is to not add the pasta until the very end as you do not want to overcook it. The ‘cheese layer’ of this lasagna soup is made from a mixture of ricotta, mozzarella and parmesan and once the soup is ready and plated add as much of the cheese as you want to the piping hot soup and watch it melt in. This lasagna soup has to be one of the best soups that I have had so far this winter and the flavours really do remind me a lot of lasagna. One of my favourite parts of this soup is that the cheese topping melts and the mozzarella get all gorgeously stringy which works surprisingly well in a soup! In addition to being pretty hearty for a winter soup, if you go easy on the cheese, and I find it hard to do that, this soup is actually on the healthier side. While I was enjoying the soup I was thinking that you could make it even healthier by adding things like spinach, kale, zucchini or even beans and I am really liking the idea adding some spinach to my next batch! Heat the oil in a large sauce pan over medium heat add the sausage and cook until lightly browned, about 10 minutes, breaking it apart as you go and set aside reserving the remaining oil and grease. Add the garlic, red pepper flakes and fennel and saute until fragrant, about a minute. Add the pasta and cook until al-dente, about 7 minutes and remove from heat. Slow Cooker: Implement step 1, optionally implement steps 2 & 3, place everything except the pasta, the cheeses and basil in the slow cooker and cook on low for 6-10 hours or high for 2-4 hours before adding the pasta and cooking on high until the pasta is cooked, about 10 minutes. Oh wow, my heart just skipped a beat. Looks wonderful! Dude, this looks freaking TIGHT. Looks delicious, as always. Happy New Year! This looks wonderful! I'm going to make it with spinach. Looks amazing! 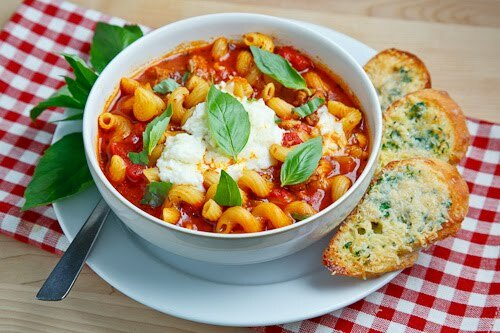 Pasta and soup, a perfect match! GREAT now I can have more lasagna haha this is a great recipe!! I love the idea! That soup looks so hearty and delicious. This is the best looking lasagna soup I've ever seen. This looks absolutely delicious! Lasagna and soup – how can one go wrong? Nice one! I've been thinking a lot about lasagna lately and having it in soup form would go SO well with my current soup obsession! This looks great. Ohh that looks really tasty. Lasagna in a soup form? PERFECT!!! OMG I love this recipe! And I love the little touches you add to your photos..the red checked table cloth is perfect! Happy new year to you! What glove size do you wear? This will give me an idea how big of a handful for the basil. Sheer genius and sheer heaven. I'm enamored with this soup and am thinking of all the possibilities. You just gave such a good idea. I would break my diet for this. Just ate this and it was deeeelicious! I'm not very good at keeping soups soupy (too long simmering? too high a heat? ), but that didn't decrease the deliciousness, I'm sure! I've seen lasagna soup floating around cybersphere and wondered – all that melty cheese just sold me. chanced upon your space while blog hopping…awesome space you have..
lasagna soup sounds hearty n divine..
thank and happy new year!!! Lasagna soup….how genius!! Perfect for cooler days! This is genius. Truly, genius. I made this tonight and it was SUPER yummy. Wonderful idea and thanks!!! This lasagna is very unique and creative.I love it! terrific looking soup Kevin. I've got to put this on my list of this to try this winter. This looks amazingly delicious. I can't wait to make it! I made this last night, Kevin, and it was really good! I cooked the sausage & onions, added garlic & fennel, and broth. But then I added the equivalent amount of some of my own leftover homemade marinara & spaghetti sauces thawed from the freezer for the tomatoes; good way to use them up! Threw in some zucchini chunks too, and may add some spinach next time. The garnish of 3 cheeses & basil was a great touch! Thank you! I am making this for a potluck this weekend! LadyJayPee: The leftover marinara would definitely add more flavour! HI this soup looks amazing… but I am vegetarian.. can u please tell the alternatives for the sausage.. Anonymous & Priya: I would go with something like a combination of spinach and portobello mushrooms as a replacement for the sausage. White beans would also be nice. You may also want to increase the amount of fennel seeds and add a touch of paprika as these are flavours commonly found in Italian sausage. I wonder why I could never succeed making this lasagna soup. At least not like the way you made it. This looks absolutely amazing! I can't wait to try it out for myself. Soup and lasagna are two of my all-time favorite things. I have made this 3 times in the last 2 months…it is SOOOO good!!!!! Would love to see recipe for the amazing looking bread as well. certifiable1: The bread is just butter, garlic and parsley topped with some grated parmesan and toasted. I made this for dinner tonight and it was awesome! My incredibly picky 5th grade son paid me a compliment by saying that it tasted as good as his school food!!! Yes, that is a compliment coming from him:). He even said he would eat it again if I made it. That is a total miracle! Usually when he tries something new, he ends up spitting it in the trash or choking it down with a terrible look on his face. I did double the noodles in it, one can never have too many noodles! Thank you! Made this last night and it was incredible. I may never bother with lasagna again! Made a bit more than expected, the broth was absorbed but it doesn't matter a bit for leftovers. OMG! That looks insanely good Kevin!! I will have to try this! I made this for dinner last night. It was absolutely delish! I subbed cottage cheese for ricotta, because I don't like ricotta, and I used ground beef. Great recipe! LOVE your recipes….such imagination…all comes out perfect!! Thanks so much for all these delicious dishes!! !